Our Caveman figure is very realistic and would look perfect in any prehistoric display. 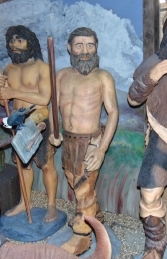 Ideally suited for a prehistoric display, our life-size Caveman looks great with our historic models, in against a rocky cave back-drop or snow scene. We have many animal models, such as the Puma, Bear & Mountain Ram models & the Animal heads, which also combine well with these prehistoric characters to give a great Ice-Age theme.